LISBON — A Jan. 22 preliminary hearing and pretrial was set in County Municipal Court for Jasmine M. Jackson, 22, Youngstown, charged with driving under FRA suspension, speeding and tampering with evidence for allegedly shoving drugs up into her vaginal cavity during a traffic stop on Jan. 3. A Jan. 17 pretrial was set for Brian M. Campbell, 31, Cream Ridge Road, Lisbon, charged with unsafe vehicle, no tail lights, marijuana drug paraphernalia, possession of drug abuse instruments and illegal possession of drug paraphernalia. Campbell allegedly had a grinder with a glass bowl, a pipe with residue on the floorboard of the driver’s side of a vehicle stopped on Saturday and hypodermic needles in his coat pocket. Frank Demont Matthews Jr., 57, South Union Avenue, Salem, was fined $950, had his license suspended for two years, sentenced to 15 days in jail and required 30 hours community service for left of center, failure to control and physical control amended from OVI second offense. Todd Varble, 51, Winona Road, Salem, was fined $400, required to attend a three-day counseling program and ordered 30 hours community service for speeding and reckless operation amended from OVI first offense. Thomas L. Clutter, 40, High Street, Leetonia, was fined $250, credited with a day served in jail and required 30 hours community service for assault amended from domestic violence for pushing his wife, Cathy Clutter and his daughter inside and outside the home, while also violently destroying a mattress with a knife, throwing clothing all over the house and pouring oil all over the kitchen floor. Ethan C. Ruffner, 28, Union Ridge Road, Negley, was fined $400, credited with eight days in jail and required 25 hours community service for assault, resisting arrest and disorderly conduct. Ruffner allegedly head butted deputy Sgt. Kevin Shulas, yelling and screaming while under the influence of alcohol while deputies were investigating a domestic dispute, and pulling away from deputies placing him into handcuffs on Jan. 6. A Jan. 22 pretrial was set for Mason A. Taylor, 18, Oakmont Avenue, East Liverpool, cited with driving under suspension and criminal damaging for allegedly stabbing three of the tires of Karen Brightwell’s vehicle on Friday. A Feb. 21 pretrial was set for Morgen J. May, 23, state Route 9, Hanoverton, charged with disorderly conduct for allegedly calling 911 several times to report he crashed his vehicle in Canton on Saturday and then was found standing outside in the snow in only his underwear, yelling and screaming and claiming to be on LSD. A March 7 pretrial was set for Carl A. Williamson, 36, U.S. Route 30, Minerva, charged with theft for allegedly taking a $150 laundry cart from the Salem Laundry Room on Dec. 2. After he was contacted by police, Williamson reportedly returned it to the police department, claiming he had only intended to borrow it, but forgot to return it. Thomas L. Castilloux, 29, South Waugh Street, Alliance, was fined $250 and credited with a day served in jail for disorderly conduct amended from domestic violence for assaulting his mother by grabbing her neck and violently shaking her, causing her to fall on Dec. 4, 2017. A March 11 pretrial was set for Brian A. Dangelo, 39, Hoopes Road, Salem, charged with aggravated menacing and criminal damaging for allegedly threatening Tim Herron, throwing a beer glass at his front door, bending the door frame and damaging the glass on Dec. 28. Kevin A. Nazario, 21, South Liberty Avenue, Alliance, was fined $400 and required 30 hours community service for driving under suspension. 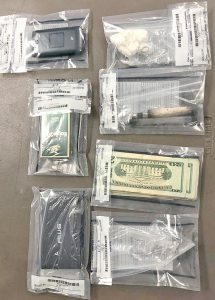 Jeret L. Hiles, 35, Youngstown, was fined $300, credited with 19 days served in jail and had his license suspended for 180 days for illegal use of drug paraphernalia and carrying a concealed weapon for allegedly having a kitchen knife with a homemade cover on it inside his back pocket and a straw for snorting drugs in his front pocket on Jan. 30, 2018. David M. Miller, 56, South Union Avenue, Salem, was fined $250, credited with a day in jail, sentenced to two additional days and required 20 hours community service for assault, aggravated menacing and criminal mischief. Miller wrote a vulgar name on the sidewalk in front of the home of someone he had a problem with on Aug. 8, then when the person came outside to confront him, a fight took place. At one point, Miller pulled his licensed concealed loaded Taurus 9-millimeter semi-automatic gun. An assault charge against Gerald Lee McMannis, 59, New Middletown, was dismissed. McMannis was accused of breaking into the home of Corey Miller and going through the bathroom door to grab Miller by the throat and punch him in the eye on Dec. 25, 2017. Jona R. Branham, 36, Salineville Road, Salineville, was fined $175 and required 20 hours community service for driving under suspension and headlights violation. Shane Burkhart, 30, West Pershing Street, Salem, was fined $150 and required 40 hours community service for driving under suspension. A March 18 pretrial was set for Scott Nelder, 26, Deming Street, Salem, cited with driving under suspension. Rachel A. Wilson, 26, 16 School Road, Wellsville, was fined $150 for failure to stop for a stopped school bus. Anthony J. Perry, 42, East 11th Street, Salem, was fined $150 for lighted lights required amended from failure to control. Richard B. Rivera, 51, West Street, Wellsville, was fined $150 for no license. An expired plate citation was dismissed. Kenneth Combs, 50, Carrollton, and Jeremy T. Crihfield, 31, Continental Drive, Salem, were each fined $100 for disorderly conduct for fighting over $5 in Salem on Oct. 17. Garmid Limary Montes Carreras, 43, Youngstown, was fined $75 for driving under suspension. Katherine A. Graham, 41, Depot Road, Salem, was fined $50 for an equipment violation amended from assured clear distance. An unauthorized use of a motor vehicle charge against Sidney D. Hill, 55, Girard, was dismissed. Hill allegedly had stopped paying on a lease agreement through Manor Leasing on Dec. 5, 2016.